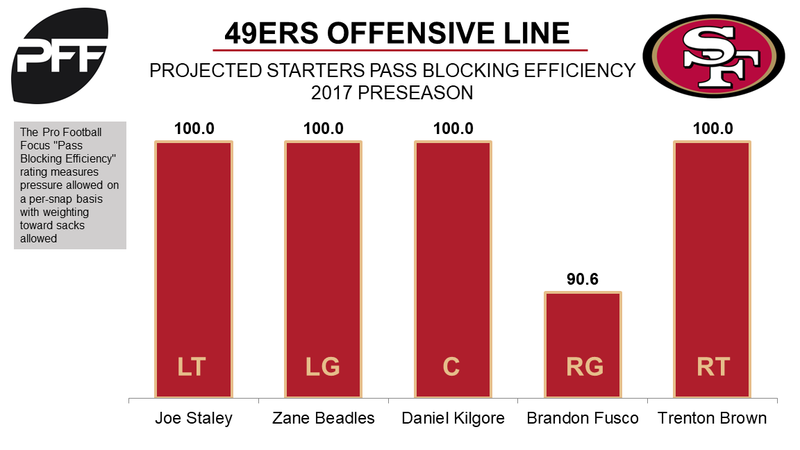 Thru two weeks of the preseason the San Francisco 49ers offensive line is currently ranked first in the league with regard to PFF pass blocking efficiency (PBE measures pressures allowed on a per-snap basis with a weighting towards sacks allowed) with a rating of 89.5. During the 2016 regular season the unit had a total pass blocking efficiency of 71.7, which ranked 29th. The 49ers have allowed just eight quarterback pressures on sixty two passing plays with particularly strong play from presumptive starting offensive tackles Joe Staley and Trenton Brown and center Daniel Kilgore, all of which have a PBE of 100.0. The 49ers will also be encouraged by the performances of undrafted free agent J.P. Flynn from Montana State. Flynn has allowed just one pressure in forty four pass blocking snaps, and his PBE of 98.3 ranks 6th among guards that have participated in at least forty one passing snaps.